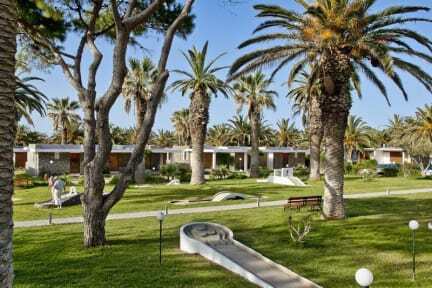 Civitel Creta Beach is a 4 –star resort hotel complex, offering spacious accommodation and an array of facilities on the 9km white sandy beach of Ammoudara. Free WiFi access is provided, and free on-site parking is possible. Heraklion City is 5 km away. This holiday hotel has a great selection of guest accommodation on offer. Guests can choose between the standard guest rooms or the pretty bungalows, amidst splendid gardens and palm trees offer garden or sea view, harmoniously fit into the natural environment, offering the guests a feeling of peace and relaxation. The main restaurant close to the beach and overlooking the Aegean Sea, offers American Breakfast Buffet, lunch and dinner on buffet style. The a-la-carte restaurant offers delicious Greek and international dishes, appetizers salads and desserts. Enjoy your coffee or drink on the large veranda of the central bar while enjoying a splendid sea view. Various snacks, ice-cream, juices or other refreshments can also be enjoyed in the pool bar. Sun beds and umbrellas are provided free of charge in the pool area and on the sandy beach. A Tennis Court, mini –golf, ping - pong, beach - volleyball, mini - football, billiard and a children’s playground exist for entertainment and exercising. Our hotel’s recreation team organizes for our guests a series of interesting activities and happenings, whereas at the mini club for children there are activities that will keep them busy in a creative way, making them, and their parents who will be able to relax even more, happy.